I've been nominated for a blogger award by Amanda (not me Amanda, obviously) and Lauren. Thanks, ladies! Per the rules of the award, I'll give you 11 random facts about me, as listed below, and then answer 11 more questions that Amanda gave me! This will be a great way for my new followers to get to know what the Lady Okie is all about. 1. I've run 4 half marathons and am currently training for my first full marathon in April 2013. 2. Every year I celebrate my half birthday. It's just more fun that way. 4. My husband and I currently have no debt. We paid off my last student loan in August 2012. We are awesome! 5. Sometimes I still sleep with Bunny, my stuffed animal I got when I was 2. 6. I don't know if Bunny is a boy or girl. 7. I guess Bunny probably should be a girl, otherwise that would be weird. Right? Now I'm confused. 8. A strawberry margarita is my drink of choice. Although tonight I went out with some friends and had a white peach margarita. It was gooood. 9. I bake really good chocolate chip cookies. 10. I bake not-so-good cupcakes. 11. I honestly love watching sports. I like to remind Jordan that he got really lucky. 2. If you could go anywhere in the universe, where would it be and why? I'd actually love to go to Alaska. My cousin lives there and sends such fun pictures. They're always building igloos and tunneling passageways in the snow between their house and garage. That, and they actually have snow on Christmas, which I'm jealous of right now. Did you know it was 70 degrees in Oklahoma this week? Crazy sauce. 3. What is your favorite thing about your town? What? You're not obsessed with the NBA like we all are in Oklahoma? 4. What is the best advice you have ever received? Anything my mom has ever said to me. 5. If you were stranded on an island what 3 things would you want to have with you? One time, I forgot to brush my teeth before leaving for work. Worst. Day. Of. My. Life. I've never had a favorite. They are all equally as amazing. 7. What is your go-to winter accessory? 8. What is your go-to beauty product? Honestly, the only thing I always use no matter what is chapstick. That and maybe lotion. I'm also pretty sure my coworkers think I'm homeless. Either it's that or they just think I don't own a hairbrush. 9. If you could do anything, what would it be? Crochet a hat! Seriously, I can make blankets and scarves with the best of them, but my hats come out looking like round potholders. It's embarrassing. 10. What is your favorite hair product? Or are you all natural? You'll have to go here for that one. I'm going to nominate Stacey for the award now. This girl has a beautiful story of faith and hope in the midst of a heartbreaking adoption story. You really should read it and be encouraged. Start here for part 1. *I'm supposed to pick 11 bloggers to give the award to, but it's late, and I'm tired and lazy. I'm going to go brush my teeth now. Loved learning more about you! I still sleep with a stuffed animal too...no shame! And maybe you should share your really good chocolate chip cookie recipe with me ASAP. I'm a sucker for any chocolate chip cookie recipe! Ironically (or not?) your potholders are nothing to sneeze at. The one you crocheted me is totes awesome. mmmm I wanna try your choc chip cookies! Hahaha love this post! I still sleep with a panda bear that my husband got me sometimes, it is a boy. ; ) And I am so impressed that you have ran 4 half marathons! That's awesome! Also...a girl can never have too many scarves! Hope you are having a great weekend! hahaha this is too funny! I love it... NEVER EVER will you forget to brush your teeth again. 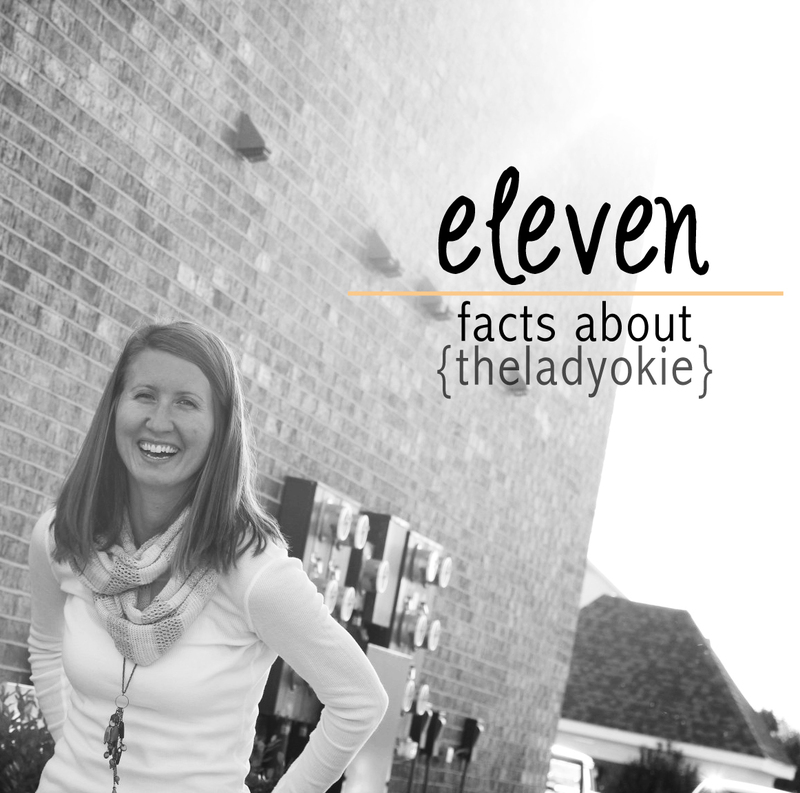 This was a super fun way to learn more about you and I am now hearing over to Stacey's blog! Hope you have a fantastic week and best of luck training for that marathon, sister... you're like a super hero to me over here who nearly died after 5 miles.... go girl, go! This was an amazing way to do this! Loved it!